Today I realized something with my blog. I’m much more of a habit guy than a goal guy. Goals are actually destroying my blog. What helps my blog to thrive is habits. Do you find yourself tweeting much more than posting your blog? Or maybe you post everything on Facebook instead of your blog. Then your experience is like mine. Perhaps you are more of a habit person than a goal person. From 2001 to 2012 I blogged almost every day. When an idea pops into my head, I would blog it. That’s a habit. My blog ran on habits. I also had an underlying to goal of blogging once a day. If I already had a blog post up for that day, I would schedule the blog post for the following day. This was my way of keeping a consistent stream of blog posts appearing every weekday on my site. Makes sense, right? The habit of posting was great. But the goal of a daily post was actually bad for me. Around 2012, I started to tweet more and more. When I had an idea I would simply tweet it. So easy! Throw the idea out there and see if it resonates with anyone. Immediate feedback means immediate gratification. Plus, isn’t that what you are supposed to do? Have lots of ideas and quickly test them. However, I would argue that Twitter is too quick of a test. Too short of a tweet. Too lost in the midst of everything. But I continued to tweet and tweet. I never really got a landslide of replies. The people who do reply, thank you! I love love love replies. But my blog got neglected. My habit moved from posting my thoughts on my blog, instead to tweeting the thoughts on Twitter. That’s huge. My habit changed from my blog to Twitter. But the goal remained with my blog. A daily blog post. I never quite made it. Sometimes weeks would go by without a blog post. Every time I would start a draft, the post would just sit in my drafts. Experts say blog posts should be long and informative. I’d write up 300 words, and then never publish, because my post was not long enough to fit the requirement of today’s experts. You don’t need every single blog post to be the wonder of all mankind. Just publish. If I have an idea, I write up the idea and publish it. Even if I have more to say. Even if I know I need to take a photo to illustrate a point. Get your ideas out there. If you want to make the super-incredible blog post that is 2,000 words long, sure, you can do it. But you are much more likely to write the longer posts, when you are in the habit of publishing the shorter blog posts. If you have the same roadblocks, just publish the blog post. You can always follow up with more later. Now I’ve been doing that. I publish right away. I’ll polish the post over the next day or so. And then I leave it alone. If I have an update, I’ll write another blog post. This activity of publishing right away has changed my HABIT. Now my habit is to write and post on my blog. And that goal of a post every day? I’ve thrown that goal into the trash. I’ve stopped scheduling my posts. Yes. If I already published a blog post for today, and I have another idea, I’ll just publish it as a second post for that day. I don’t schedule it for the future. This has created a whole new attitude for me. Now it’s not about getting a post once a day. That goal no longer exists. Now it’s simply: have idea, publish idea. I have a HABIT. The goal is trashed in favor of establishing a habit. 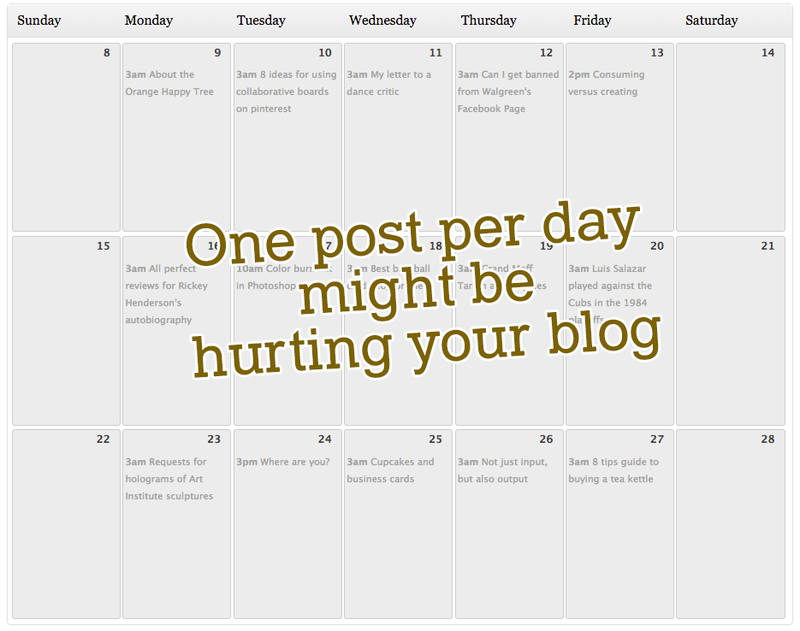 A goal of publishing one blog post per day might work for you. That’s great. It doesn’t work for me. If you haven’t been publishing much on your blog, you might consider switching over to embracing the habit of quick posting. I think if you day I will write the post and what I have after 30 minutes is what you post.